WASHINGTON — The American commander in Afghanistan now believes that United States troops probably did not follow their own rules in calling in the airstrike that decimated a Doctors Without Borders hospital when no American and Afghan troops were in extreme danger, according to officials with direct knowledge of the general’s thinking. Under the rules, airstrikes are authorized to kill terrorists, protect American troops and help Afghans who request support in battles — like those in Kunduz, recently taken over by the Taliban — that can change the military landscape. The idea is to give troops leeway but keep Americans out of daily, open-ended combat. The Special Operations Forces most likely did not meet any of the criteria, the commander, Gen. John F. Campbell, has said in private discussions, according to the officials, who spoke on the condition of anonymity because they were not authorized to discuss the matter. The Special Operations Forces also apparently did not have “eyes on” — that is, were unable to positively identify — the area to be attacked to confirm it was a legitimate target before calling in the strike, the officials said. 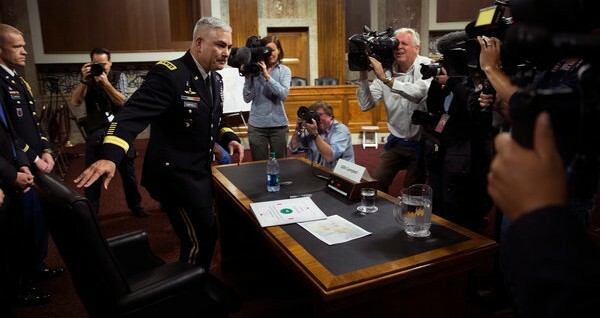 Regardless of what mistake may have been made, General Campbell told a Senate committee on Tuesday that the strike was ultimately the result of “a U.S. decision made within the U.S. chain of command.” He took responsibility for the sustained bombardment of the medical facility, which he said took place in response to an Afghan call for help. “Obviously, the investigation is still underway, but Campbell’s thinking now is that the Americans on the ground did not follow the rules of engagement fully,” said one of three American officials, all of whom emphasized that no final conclusions had been reached and that the inquiry could yield different reasons for what transpired. If the American troops did not follow the rules, it is not clear why, or how far up the chain of command the decision to allow the strike was made. Nor is it clear if any of the Afghan or American troops involved in the strike knew that they were unleashing a sustained air attack on a hospital. General Campbell’s public remarks and what he has said privately, based on reports from his investigating officer, Brig. Gen. Richard Kim, suggest a chain of mistakes likely led to the attack on the hospital. In his testimony before the Senate Armed Services Committee, General Campbell offered few new details about the attack, which lasted for more than a half-hour and killed 22 patients and hospital staff members in northern Afghanistan on Saturday. The general said a fuller accounting of what took place would come out through an investigation now underway. “I must allow the investigation to take its course,” he said. After days of shifting and at times ambiguous American statements about the airstrike, which Doctors Without Borders has likened to a war crime, the general was as direct on Tuesday as any official has been to date. “A hospital was mistakenly struck,” he said. The general said the military had received a request for air support from Afghan troops fighting to retake Kunduz from the Taliban. Yet General Campbell offered little clarity about how that procedure failed or what events led up to the strike. The bombing in Kunduz and the faltering attempt by Afghan forces to recapture the city have renewed questions about the shape and scope of the American mission in Afghanistan. Most of the roughly 10,000 troops now there are focused on training and advising Afghan troops, and the White House placed broad limits on when and where the United States could use force after the American combat mission ended last year. At the same time, it has given General Campbell wide discretion to do what he deems necessary to aid Afghan troops. For the most part, that has meant using air power. But the fighting in Kunduz over the past 10 days has illustrated the limits of air power. It has also offered a reminder of the danger airstrikes pose to civilians, who have repeatedly been killed by American aerial bombardments since the outset of the war 14 years ago. American officials have said they were reluctant to use air power to stop the Taliban from seizing Kunduz on Sept. 28 because they feared the possibility of civilian casualties. But with forces struggling to retake the city, American troops responded to a call for help on Saturday by dispatching an AC-130 gunship, a powerful and precise attack aircraft that is typically used to support raids and other counterterrorism operations by Special Operations Forces. General Campbell said on Tuesday that the gunship had been in communication with American advisers on the ground in Kunduz. But he did not say if anyone involved in the strike realized a hospital was being targeted or if they were reliant on Afghan forces to identify the building to be hit. “There were not American forward air controllers on the ground?” asked Senator John McCain, an Arizona Republican who heads the Armed Services Committee. “Sir, we had a Special Operations unit that was in close proximity that was talking to the aircraft that delivered those fires,” General Campbell replied without elaborating. Before the general’s testimony, Doctors Without Borders put out a statement reiterating its allegations that the destruction of the hospital amounted to a war crime, and repeating its call for an independent investigation. “This attack cannot be brushed aside as a mere mistake or an inevitable consequence of war,” Dr. Joanne Liu, the president of Doctors Without Borders International, said in the statement. The bulk of the questions directed at General Campbell on Tuesday centered on plans to continue the withdrawal of American troops from Afghanistan in the coming year. The recent gains by the Taliban appear to have restarted a debate within the Obama administration about whether to move forward with plans to cut by about half the current American force. The Pentagon, along with some senior officials within the administration, is pushing to maintain as large a force in Afghanistan for as long as possible, arguing that the Afghan Army and police are still in need of American assistance. The Republicans on the committee left little doubt that they believe the administration’s withdrawal plan would leave the Afghans dangerously exposed to their enemies. General Campbell was clear that he, too, would prefer to keep as many troops in Afghanistan for as long as possible. But he was circumspect about numbers and specific plans, perhaps well aware that a number of his predecessors had angered the White House by too publicly pushing for more resources.